White Knight Chronicles Preview: Her Head Is So Huge! A little hands-on time with Level-5's PlayStation 3 RPG White Knight Chronicles last night demonstrates why you should never let a slightly-drunk journalist have a go at your character creator. White Knight Chronicles is an action role-playing game developed exclusively for the PlayStation 3 by Sony's Japan Studio and Level-5 of Dark Cloud and Rogue Galaxy fame. We started off with a little rudimentary combat, with my party of two story characters and one player-created character wandering the countryside, taking out random monsters using the active real-time battle system, which is somewhat reminiscent of Final Fantasy XII. You control one character while the other two fight on their own, following your general commands - attack, withdraw, etc. - if you choose to issue them. Upon targeting a creature, hitting X brings up a list of commands and attacks you can scroll through. Selecting one while close enough to an enemy to attack will launch said skill, after which you must wait for a circular meter to fill before you can act again. It's not quite turn-based, as positioning comes into play, but it definitely isn't an action RPG either. The level of monsters we were facing seemed a bit low, with my AI companions generally finishing them off before I had a chance to swing. Soon enough, however, we came across a towering ogre that required more than a few quick swings to take down. This gave me an opportunity to use the main character Leonard's transformation skill. A meter on the side of the screen slowly fills as you do battle, and once it has enough points you can use skills that require said points. The transformation skill changes Leonard from a small yet capable fighter into the powerful (and titular) White Knight. Easily three times the size of his companions, the White Knight is extremely powerful, felling the ogre and clearing the area of enemies way before the timer for the power ran out. Once the area was cleared, Leonard suddenly became Leonard once again. I switched to the female member of my entourage, Yulie, and gave the combo system a spin. There's a huge focus on customization in White Knight Chronicles, and creating custom combos is just one aspect of that focus. A character can create a combo of up to seven skills, with the number of skills dictating the number of ability points needed to pull off the combo. Creating custom combos allows you to forgo selecting your attack skill every cycle of your timer, instead simply hitting the "X" button at the appropriate time to trigger the next attack in the sequence. I tested out Yulie's combo on another giant create, a treant, targeting its knees to immobilize it before finishing it off. Quick and easy. The third character in my party was the custom character that each player creates at the beginning of the game. The custom character travels with the party for the entire length of the game's story, and is also used in White Knight's online co-op modes. The helpful lady walking me through the game let me go into character creation, where the amount of customization options is quite extensive and easily exploitable by members of the press who've had one too many Red Bull and vodkas. My demo-driver watched in horrified amusement as I set the body to extremely small, made the head impossibly huge, and gave my creation a chin that would make Jay Leno feel like a male model. I named her Kotaku. As you can see in the image above, our little Kotaku appears in the game's cut scenes along with the story characters, allowing you to come up with your own reasons as to why your custom character is with the party. In Kotaku's case, she doesn't realize how hideous she really is, and often spouts out "Love me!" at inappropriate times. Leonard just doesn't seem to know what to make of her, but figures it's probably best to keep her close. Maybe he'll get lucky and a monster will eat her. After fighting a few starting enemies with her new friend, Kotaku got distracted by the cookies on the dessert cart at Sony's Comic-Con 09 cocktail mixer and wandered off. The game is complete and released in Japan, so in that country at least I'd say it's pretty far along. We're looking at a 2010 release in the states, so there's still plenty of localization left to do. A Little Slow: The frame rate in the build I was playing seemed a bit choppy now and again. Nothing too huge, but definitely enough to be noticed. Active Turn Based? : I love turn-based roleplaying games. 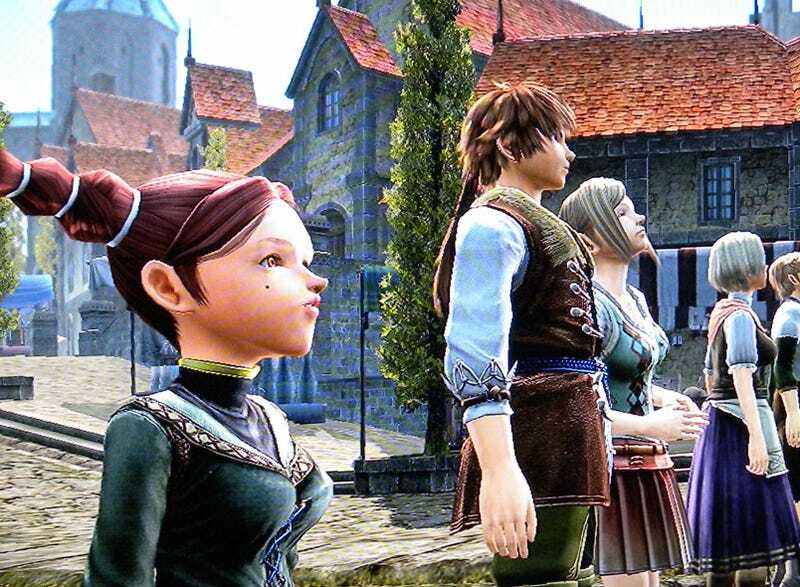 It's only been over the past few years that I've really begun to appreciate a good team-based action RPG. What I am still having trouble with is attempts to combine the two formats into some sort of hybrid. I wasn't all that fond of the Final Fantasy XII battle system, and White Knight Chronicles seems to lack the polish that Square Enix put on theirs. Watching a white circle slowly drawing itself on your screen just doesn't seem like a fun way to spend several hours battling the forces of not good. Deep Character Customization: I'm a sucker for adding a little bit of myself to a game I'm playing, even if that little bit is slightly tipsy. Not only do you get pages worth of options for tailoring your character's look to your taste, once a cut scene kicks in you get to see them actively participating in the game's story. Then you can use your imagination to fill in the blanks. You can even be comic relief! Looks Just Lovely: White Knight Chronicles is very easy on the eyes. The monster designs particularly stand out, with massive, gorgeous creatures towering over you and your party making you feel like you've actually accomplished something in taking one down. White Knight Chronicles seems to capture the grand scope and epic feel I enjoy in my roleplaying games, but the hybrid battle system just didn't feel all that satisfying to me. Perhaps once I have the game's full 100+ hours laid out before me and my little mutant Kotaku girl by my side for the long haul I'll feel differently.